PSC200 - Carry-on Apple Laptop & Camera Case- Customized foam cut-out lid for Mac Books and padded dividers protect sensitive digital equipment. Mobile Filing Cabinet Case protects important documents during natural disasters. 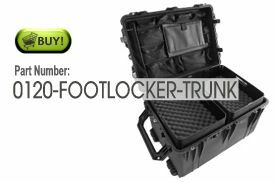 Matrix Shipping Cases are built to your specifications. Cases can be built up to 132 inches in length. The Multiple iPad Charging Station charges 10 iPads while allowing for iPads to be kept secure.